*Note: The above links to Amazon and Book Depository are affiliate links. Affiliate links support giveaways for Somewhere Only We Know readers. Goodreads description--American life can be excessive, to say the least. That’s what Jen Hatmaker had to admit after taking in hurricane victims who commented on the extravagance of her family’s upper middle class home. She once considered herself unmotivated by the lure of prosperity, but upon being called “rich” by an undeniably poor child, evidence to the contrary mounted, and a social experiment turned spiritual was born. 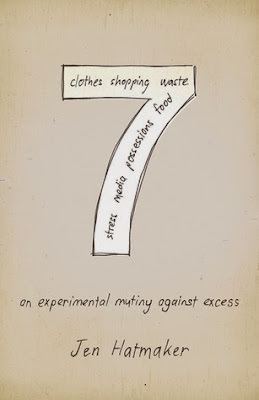 7 is the true story of how Jen (along with her husband and her children to varying degrees) took seven months, identified seven areas of excess, and made seven simple choices to fight back against the modern-day diseases of greed, materialism, and overindulgence. Food. Clothes. Spending. Media. Possessions. Waste. Stress. They would spend thirty days on each topic, boiling it down to the number seven. Only eat seven foods, wear seven articles of clothing, and spend money in seven places. Eliminate use of seven media types, give away seven things each day for one month, adopt seven green habits, and observe “seven sacred pauses.” So, what’s the payoff from living a deeply reduced life? It’s the discovery of a greatly increased God—a call toward Christ-like simplicity and generosity that transcends social experiment to become a radically better existence. My friend, Kay, recommended 7 to me a while back. Her Bible class group went through it and she really enjoyed it. I’ve had it on my TBR list for at least a year if not more. I finally saw that the e-library had it available on audiobook and so I jumped on it. Some background information though might be important. My husband and I live in a 1800ish square foot house built in the 1960s. Even before we married, 6 years ago, we’ve been working to renovate the house. It’s a slow process—even slower because we actually live in the house. We’ve painted. We’ve replaced. We’ve pulled out. We’ve thrown away. Oh and we’ve painted some more. One thing that was not a priority in the 1960s apparently was storage. Our closets are tiny. The kitchen is small (though not tiny), but the kitchen cabinets are tiny. A regular size box of cereal or bag of chips will not fit in one of our cabinets. We can stack one regular sized canned product on top of another. That’s about as tall as most of our cabinets are. The shelves are not adjustable. But it’s just the two of us, right? (For now.) And all things are relative. While I sit here and complain about the storage space available in our house, the real problem is that we have too much stuff with nowhere to put it. After my dad visited the Philippines on a mission trip where most people he encountered live in bamboo houses, and we heard through the grapevine about a family in Africa who was trying to get enough money together to build a mud house I started re-evaluating how blessed I am over the lack of storage space I have. All of this has had me thinking about my own personal excess in life. Enter 7. The title and description pretty much sum this book up perfectly. The author, Jen Hatmaker, had a poor child temporarily staying in her house comment on how rich she and her family was. This really stuck with her. With some direction/motivation from something a friend of hers was doing, the idea of 7 was born. As the description says, she identified 7 areas of excess in her life: food, clothes, spending, media, possessions, waste, and stress. Each area was designated a month—30 days—of focus on reducing the excess. Again…repeating the description above, but 1) Food – Only eat 7 foods; 2) Clothing – Only wear 7 articles of clothing; 3) Possessions – Give away 7 things each day; 4) Media – Eliminate the use of 7 media sources; 5) Waste – Adopt 7 green-living habits; 6) Spending – Only spend money in 7 places; 7) Rest – Observe “7 sacred pauses” each day. One thing that I like about 7 is that Jen Hatmaker isn’t trying to project this experiment on any and every one. She simply saw 7 areas in her life that she could cut back on and set out on her own personal experiment that she just so happened to write a book about, documenting her experiences. Sure she learned some very valuable lessons each month, and sure she would recommend those lessons to anyone, but she’s not saying throughout this book “you need to try this”. Of course, friends and family and strangers who have heard about her experiment have decided to try it for themselves, but this isn’t something that she’s projecting onto other people. I loved the lessons that Jen Hatmaker learned, and I really do want to implement some of these ideas into my own life. There are so many things lying around my house that aren’t being used by me that someone else might be able to benefit from. I have clothes upon clothes upon clothes that I don’t wear. Let’s face it, a large portion of those clothes currently don’t even fit. I’m thankful that my life isn’t as busy as some. But yet I often find myself feeling overwhelmed, overworked, and exhausted mentally if not physically. Implementing practices that will lead to a more “rest”-filled life sounds like heaven. Point being…there are definitely areas I want to make some changes in my life to cut back on excess as well. During the time she was writing this book, Jen Hatmaker (I keep wanting to call her “Jen” like we’re friends) and her husband, Brandon, were in the process of adopting two Ethiopian children. All of the sections in this book related to her adoption were particularly moving to me. When she discusses being completely disgusted with her natural born children throwing out almost a pound of chicken fingers simply because they did not have ketchup to go with them when her soon to be adoptive children likely went to bed with hungry bellies was particularly emotional. And even more than that, during the last month—the Rest month—when Jen (I’m rolling with it) and Brandon were both struck with a strong desire and need to pray for their adoptive children (not even knowing who these children would be exactly), and then she finds out that the exact day they were pressed with this need is the exact day the 5 year old little girl they ended up adopting was being abandoned at the orphanage. Now that…that got me for sure. Moments like this were sprinkled throughout the book, and I’m thankful for getting to experience this book and see God work in the lives of people I don’t know and have never met. It warms my heart and builds my faith. Ultimately I think of all the blessings that I’ve been given stewardship over in my own life, and I have to ask myself whether I’m being a good steward or not. And that’s one thing that 7 helped me to do—to realize how much work I have left to do. I highly recommend 7 to anyone who is feeling overwhelmed in their lives. Reduce, reuse, recycle. Cut back. Give away. Donate. Repurpose. 7 gets 4.5 Stars from me. Have you read 7? What did you think? Let me know! Also, side note...the narrator, Rebecca Gallagher, of the audiobook did such a good job that I just KNEW it had to be Jen Hatmaker reading the book herself. Yet when I went to double check that fact, I realized it was someone else entirely which means I was highly impressed. Clicking on the banners below and other affiliate links supports Somewhere Only We Know. Any funds received from purchases through these sites from this blog sponors giveaways for Somewhere Only We Know readers. No content from this blog may be used or copied without written permission from the author. All content found on this site is created or collected by Sandy @ Somewhere Only We Know. Quotes from my reviews may be used by publishers and authors.